Some 55% of creative advertising and marketing professionals say changes in their organizations are not considered carefully and are not well planned, according to a recent report from The Creative Group. Moreover, 53% say their employers do not do a good job of involving employees in implementing changes, and 49% say they do not receive adequate training/information to keep up with industry developments. 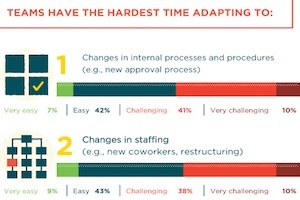 The survey of 750 US creative professionals at advertising agencies and brands found the introduction of new internal processes/procedures is the change that workers have the hardest time adapting to (51% rated it as challenging/very challenging). That was followed by staff changes (48%) and new business directions (37%). About the research: The report was based on data from a survey of 750 creative professionals at advertising agencies and brands in the United States.